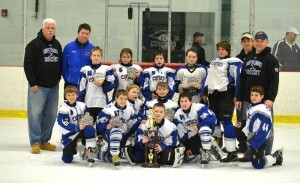 The Oswego Clearview Squirt Team (shown pictured) finished second in the John Abbott Memorial (JAM) Tournament recently at SUNY Morrisville. Oswego, NY – The Oswego Clearview Squirt hockey team traveled to SUNY Morrisville recently to compete in the season-ending John Abbott Memorial (JAM) Tournament. The team capped off a successful 21-13-4 year by making it to the tournament championship, before falling to Camillus 1 by the score of 2-0. The Oswego Squirts defeated Camillus 2 5-1; defeated Fulton 4-1; lost to Valley 6-1; and defeated Camillus 1 2-1; to garner a tournament high 12 ½ points in the 5 point scoring system, and advance to the championship. According to Koproski, Oswego defeated both Camillus teams in the tournament after going winless (combined 0-4) against those teams during the regular season. The Oswego Squirts’ balanced scoring attack and outstanding goaltending by Tyler Wallace led the team throughout the weekend. In their first game against Camillus 2, Oswego got four goals from forward Nick Burnett, and one from Andrew Noyes, to secure the first round 5-1 win. Oswego scored the first four goals of the game and Tyler Wallace made 17 saves in the win. Clearview forwards Spencer Stepien, Jeremy Susino, Jack Stephens, Spencer and Alex Koproski each had two assists in the contest. Mason Bricker added one assist. The following day, Oswego went up against Fulton and came out with a 4-1 victory after another strong effort and hat trick from Burnett. Koproski added a goal and 2 assists; Stephens 2 assists; Stepien 1 assist; Noyes 1 assist; Susino 1 assist; and Lane Phillips 1 assist. Wallace played strong again in net for Oswego and had 16 saves in the win over Fulton. In the second game of their Saturday double-header, Oswego took on Valley, who came out on the offensive against Oswego. Valley scored 42 seconds into the game, and quickly scored 2 more goals within the first five minutes of the first period. Oswego’s Stepien cut Valley’s lead to two with assists from Koproski and Stephens, but Oswego was unable to find the back of the net for the remainder of the game. Valley went on to win 6-1. Wallace had 22 saves in the loss. On Sunday against Camillus 1, earned a 2-1 win and advanced to the championship game. Oswego got on the board early with a goal from Noyes at the 4:03 mark of the first period off assists from Burnett and Koproski. Noyes would add another later in the first off assists by Stepien and Burnett. After a scoreless second period, Camillus cut Oswego’s lead to one with a goal at 11:26 of the third period. Oswego goalie Wallace and a strong defense led by Isaiah Raby, Patrick Galvin, Bryson Bush and Phillips turned back Camillus the remainder of the game to secure the 2-1 victory. In the championship later that day, Oswego was once again pitted against Camillus 1. And despite losing earlier in the morning to Oswego, the Camillus squad came out strong and scored the first goal of the game at 3:05 of the first period, and added a second just minutes later. Despite a number of opportunities, Oswego could not find the net and lost to Camillus 1 2-0. “It was a great tournament and an even greater season,” said Koproski. “I can’t thank our kids, coaching staff, and parents enough for making it a great year! “While it was tough to lose the championship we can all be proud of the effort that was put forth, at the tourney and throughout the year,” he added. Fore more information visit the team’s website at www.eteamz.com/oswegosqurts2.